What exactly are little league baseball practice plans? Quick, tell me. That’s kinda what I thought, a hundred different answers and/or definitions. The term is too broad and the game is too complicated to follow a Cookie Cutter type practice plan which covers everything there is to know. Where am I going with this? There are the basic Hitting, Catching and Throwing drills which is common to every practice, but some coaches feel they must have their players leaping through the air or doing double back flips (a slight exaggeration) in order to feel like they had a productive practice session. Teach the proper method and elements of the drill; then repeat, repeat, repeat and then repeat again. Let’s look at a few somewhat simple drills, which will pay big dividends in the future, short and long term. We continually tell our players to use their wrist when throwing, therefore use this drill. (4.) Flip the baseball to their partner using Only their wrist. This strengthens the wrist as well as acclimating the player to their wrist movement when throwing. This drill can be performed standing or kneeling and as the players’ strength increases, so does the distance they throw. The crow hop taken in order to build momentum for a high velocity throw is simplistic in nature, but in reality must be practiced in order to perform it quickly and correctly. (2.) They are to play simple catch Except, the emphasis should be put on executing a quick short crow hop. Repetitive practice of this foot and body movement will become second nature requiring no thought process on the part of the player to implement. There will be instances a ball is hit so hard and gets to the infielder so fast, he won’t be able to adjust and will either catch or miss the ball through instinctive hand movements. The primary intent of this drill is to create quick hands, and accustom the player to fielding a ball with a back hand position of the glove, which requires twisting the wrist backwards in a very uncomfortable position. (3.) Increase the speed as the player becomes quicker and occasionally throw a ball to his glove hand in order to keep him from fudging on his hand movements. 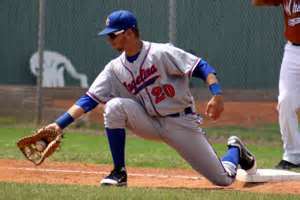 The majority of bad throws to first base are low which creates an extreme stretch or a short hop situation for the first baseman. Although it may appear MLB first basemen are just lucky when they dig the ball out of the dirt, if you think about, they rarely ever miss. That’s not luck. There’s only one way to practice short hops and that’s to field them. b. We don’t want to unconsciously instill a bad habit into players of short arming the ball. Muscle memory can be negative as well as positive. (4.) The bounces should be thrown to the first baseman’s left and right as well as directly at him. 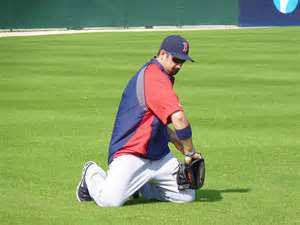 The first baseman is exposed to playing the ball from all infield angles, which helps him practice foot movement as well as hand. You would think a ball hit to the shortstop or second baseman close to second base would make for a much easier double play, and if it’s fielded close enough for a single fielder to make the play themselves, that’s true. However, it’s the ball that’s hit close, but just not quite as close as it needs to be for one fielder to complete the play which creates problems. Indecision is the first issue the infielder must deal with. Can I or Can I not make the play by myself? Rule of thumb, if the ball is fielded any farther than 6’ from the base or your momentum is not taking you in a direct path to the base, toss the ball away to your partner. 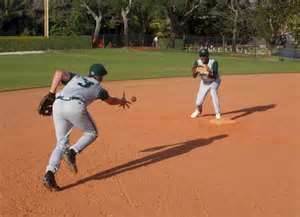 You have to remember while you’re covering that 6 foot, the 2 base runners are also covering the 6 foot, or more, reducing the chances of pulling off a successful double play. Sounds simple enough, but the placement and the timing of the throw is critical in order to make the double play. (2.) From behind the pitching mound, roll grounders, ½ to ¾ speed to either side of the base and about 6’-8’ feet away from it. (4.) 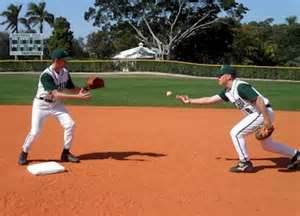 Location and speed of the toss is critical and is what should be practiced.Do not have the players complete the throw to first base, but rather quickly return to their position for another rep. 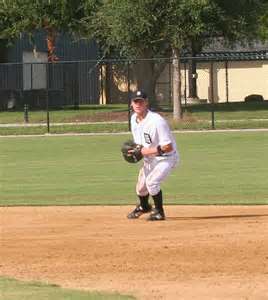 This repetitive fielding the ball, locating the other player, tossing at the correct height and speed, will result in many double plays and/or force plays occurring which would not have happened without the practice.